This is surgery to repair a damaged or torn tendon. A tendon attaches muscle to bone. If a tendon tears, the muscle will no longer be able to work properly. This will cause weakness or loss of function. Reattaching the tendon can fix the weakness and improve function. Talk to your doctor about your medications. You may need to stop taking some medications 1 week prior to your procedure. A cut will be made in the skin over the injured tendon. The torn ends of the tendon will be sewn together or reattached to the bone. If you have a severe injury, a tendon graft may be needed. 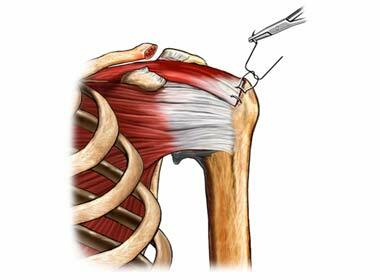 In this case, a piece of healthy tendon will be taken from another part of the body. This healthy tendon will be used to reconnect the broken tendon. The area will be examined for injuries to nerves and blood vessels. Lastly, the incision will be closed with stitches. You may be put in a splint or cast. This is to keep the injured area in position for proper healing. The splint or cast will usually stay on for a period of weeks. This depends on where the tendon is located and the severity of the injury. Anesthesia will keep you pain-free and comfortable during the procedure. To reduce pain after the procedure, your doctor may recommend pain medication. After the procedure, you will be in a recovery room. The staff will monitor your progress. You may also get pain medication. You will start physical therapy soon after surgery. Your doctor or physical therapist will recommend exercises or rehabilitation program. Achilles tendon rupture. Foot Health Facts—American College of Foot and Ankle Surgeons website. Available at: https://www.foothealthfacts.org/conditions/achilles-tendon-rupture. Accessed February 8, 2018. Achilles tendon rupture. EBSCO DynaMed Plus website. Available at: https://www.dynamed.com/topics/dmp~AN~T116632/Achilles-tendon-rupture . Updated March 21, 2016. Accessed February 8, 2018. Rupture of the biceps tendon. Ortho Info—American Association of Orthopaedic Surgeons website. Available at: http://orthoinfo.aaos.org/topic.cfm?topic=A00031. Updated December 2013. Accessed February 8, 2018.